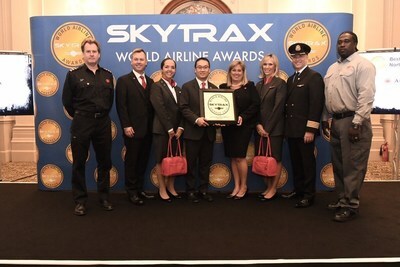 MONTREAL, July 17, 2018 /CNW Telbec/ - Air Canada was named Best Airline in North America for the second consecutive year at the 2018 Skytrax World Airline Awards ceremony held today in London. It is the seventh time in the past nine years the carrier was selected as the best in North America by the World Airline Awards, which are based on passenger satisfaction surveys of approximately 20 million global travellers. "This award shows that our customers, whom we thank for their continued loyalty, appreciate the investments Air Canada is making to deliver service that is the best in North America and increasingly recognized as industry-leading globally. This includes ongoing investments in customer service training, as well as our fleet renewal program, our strategic global network expansion, and the recent launch of Air Canada Signature Service, an end-to-end premium travel experience," said Benjamin Smith, President, Airlines and Chief Operating Officer at Air Canada. "I also thank our employees for their unwavering commitment and together, we look forward to introducing further enhancements for customers, such as the current roll-out of satellite Wi-fi on our widebody fleet, the delivery of the new Airbus A220-300 (formerly known as the Bombardier C Series) aircraft next year, and beyond that the launch of our new loyalty program, which will offer additional earning and redemption opportunities through an advanced digital experience." Enhanced onboard amenities such as signature dishes prepared by Chef David Hawksworth coupled with wine pairings by world-renowned sommelier Veronique Rivest, and in-flight Wi-fi connectivity fleet-wide in North America, which is now being progressively implemented onboard the international fleet, to complement Air Canada's personal seatback In-Flight Entertainment System that offers hundreds of hours of free digital audio-visual content. Celebrating their 18th anniversary, the World Airline Awards are independent and impartial, and was introduced in 1999 to provide a customer satisfaction study that was truly global. Skytrax pay all costs of the Survey and Awards event. Airlines do not pay any survey entry or registration fee, and the awards event is free to attend. There are no charges for airline use of the award logos and results. Over 100 customer nationalities participated in the survey with 20.36 million eligible entries counted in the results. All survey entries were screened to identify IP and user information, with duplicate, suspect or ineligible entries deleted. 335 airlines are featured in the survey results. The online survey operated from August 2017 to May 2018, together with invitations sent to previous year respondents in the survey database (total 24.45 million customers). Customer survey forms were offered in English, French, Spanish, Russian, Japanese and Chinese. The highest nationality increase in the 2018 survey was Chinese customers with an additional 3.5 million entries.